This page was last updated on: 2014-01-02. What is the ACT, and why is it important? How is the ACT different from the SAT, and which test should I take? What do I have to bring with me when I take the test? When do I get my ACT score back? What does my ACT score rank mean? What are the best study resources / materials / books for the ACT? What math do I have to know for the ACT? Is it advanced math? Do I have to report all of my scores, or can I choose which scores to report? When do most people take the ACT? Which is the best month, or easiest month, to take the ACT? What is the ACT curve? Can I get my test back? Can I use mechanical pencils on the ACT? Are calculators allowed on the ACT? Can I take my cell phone into the test center? I am not in high school. Can I still take the ACT test? Your ACT FAQs page didn't answer my question. Where can I get more information? The ACT is a test administered to high school students in order to assess their ability to succeed in college, independently of high school grades and other indicators. The ACT is a paper-based test, consisting of multiple-choice questions (four or five possible answers) along with an optional essay. All four-year colleges and universities now allow the use of the ACT as a replacement for the SAT, and some colleges have made both the SAT and ACT optional. Questions remain as to the usefulness of these tests in predicting future success in college. Nonetheless, about 2.5 million students take the ACT each school year. This PDF file has charts showing the number and percent of seniors taking the SAT and ACT tests over the last 20 years. 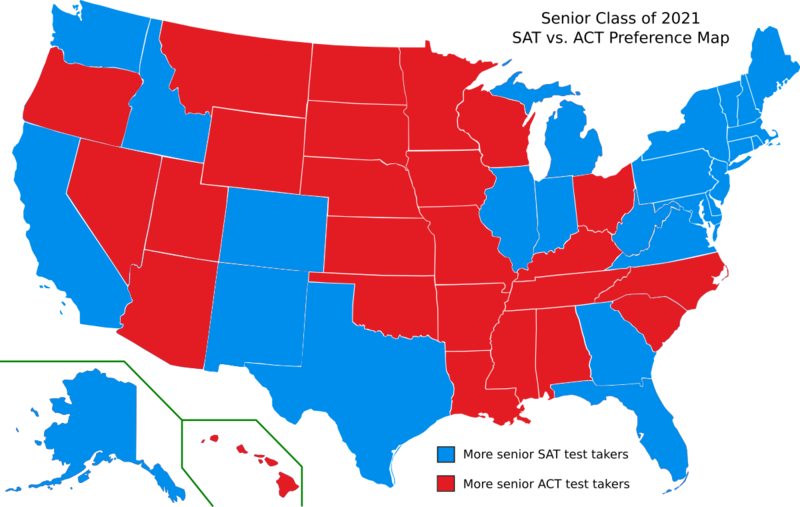 This U.S. map shows the relative popularity of the SAT and ACT tests for each state. The ACT is more an achievement test than a reasoning test, and the SAT is more a reasoning test than an achievement test. For example, an ACT math question might ask you: "What is the eighth term of the geometric sequence 2, 4, ... ?" An SAT question testing the same math topic would say: "The first term of a sequence is 2, and every term thereafter is twice the previous term. What is the eighth term?" The ACT scoring does not penalize for wrong answers on multiple-choice questions; the SAT does. The ACT math section is multiple-choice only; the SAT has some open-ended math questions. The ACT writing essay is optional; the SAT essay is mandatory. The structure of the ACT is more straightforward than the SAT: each scored subject is given only one timed section on the ACT. On the SAT, math, critical reading, and writing are each broken up into several timed sections. The ACT is more speeded than the SAT: the scored, non-essay portion of each test takes 175 minutes to complete. However, this portion of the ACT has 215 questions (about 48 seconds per question) compared to 170 questions on the SAT (about 1 minute per question). The ACT test includes a science section; there is no corresponding section on the SAT. Being a guy who loves data, when someone asks me which test he or she should take, I say: "I don't know. Why don't you try taking both to see how you do on each?" (Unfortunately, that isn't the easy answer that most people want to hear!) One way to follow this advice is to fully prepare for both tests and take the SAT and ACT once or twice each. If you would like to figure out which test is better for you before taking each one for real, try taking a complete, actual ACT and SAT test at home (even if you haven't studied much for either one) and compare those scores. If you do this, don't use anything other than real SAT and ACT tests; the official practice tests released each year by the College Board and ACT, Inc. are perfect for doing your own ACT vs. SAT comparison. When you do finally have scores for both tests, how do you know on which test you did better? A simple way to compare ACT scores against SAT scores is to compare the percentile ranks. For example, if your SAT Critical Reading percentile rank is 70 percent and your ACT Reading score rank is 60 percent, then your SAT reading score would be considered better than your ACT reading score. You can compare the math and reading sections on both tests directly in this way. Your ACT or SAT score report will list your score ranks. If you took the tests on your own, you can find the current ACT score ranks here and the current SAT percentile ranks here. You may also find the ACT-SAT concordance table useful for comparing SAT combined scores against the ACT composite score, or comparing the SAT writing score against the ACT English/writing score. The ACT is administered in September, October, December, February, April, and June. (Note: the February test is not available in New York, possibly due to New York's 1979 "Truth-In-Testing Law". If you have better information than I do about this please let me know.) The ACT is administered nationally on the same dates for every state in the U.S. For the test dates and fees for the current test year, and for information about taking the test outside of the U.S. and Canada, see the SAT & ACT Calendar. The test is given on a Saturday, and under special circumstances you can take it instead on the following Sunday. The ACT is administered in many locations in the U.S. and countries around the world; typically, these test centers are in schools. To find a test center appropriate for your location, go to this ACT web page. For U.S. locations, specify the state without specifying a city to obtain a list of all the test centers in that state. Your ticket. You'll get this when you register. Your photo ID. The picture should look like you do now, not how you looked three years ago. Some #2 pencils. Bring a few but don't go crazy. A calculator. See this FAQ for details. A watch. No alarms or beeping buttons! A cheap analog watch (with hands) is good. Your brain. Very important. Do not forget to bring it! Although proctors are supposed to let you know how much time you have left in each section, do not depend on this! (Hence the watch in the list above.) Optionally, you may also want to bring a snack, a cell phone (but see this FAQ), and extra calculator batteries. The total test time for the ACT with the optional writing section is 3 hours and 25 minutes. (Without the writing section, it is 2 hours and 55 minutes.) With short breaks given during the test, the total elapsed time for the ACT (with writing) is about 3 hours 45 minutes, and the total time without the writing section is about 3 hours 10 minutes. The test administration will begin sometime between 8 a.m. and 9 a.m. local time, depending on the particular testing site, and end by about 12:45 p.m. Generally, you should plan to arrive at the testing location a comfortable amount of time before 8 a.m. Shown below is the time breakdown of the ACT test. On some test dates, ACT Inc. includes an extra section in the test in order to develop new questions. Your score will not be affected by your answers to these questions. (*For 2013 and later, ACT Inc. included extended-time test takers in its senior class statistics.) For all of the yearly average ACT scores from 1970 to the present, see this PDF file for a plot and this PDF file for the data. The average ACT scores and other statistics for the most recently graduated high school class can be found here. Scores are first released via the Internet about 2.5 weeks after the exam is administered. Generally, the scores will appear on the ACT web site starting at roughly 1 A.M. Eastern Time (5 A.M. or 6 A.M. UT depending on whether or not U.S. daylight saving time is in effect). Not everyone's scores will appear immediately. On the score release day, you will get scores for the English, math, reading, and science sections along with your composite score. About two weeks later, the web site score report will also include your combined English/writing score, as well as the essay score. Not everyone will receive his or her scores on the report day; scores can take from three to eight weeks after the test date to be released. For the actual score release dates for the current test year, see the SAT & ACT Calendar. After you have taken an ACT, your scores are compared to those of other people who have recently taken an ACT. (See the next paragraph.) Your score rank (also called the "percentile rank") is the percent of those test takers who scored at or below your score on that section of the ACT. In principle, the score rank ranges from 0 to 100. However, for some reason, ACT, Inc. does not give a rank of 100 even if your score is 36, so in practice, the highest rank possible is 99. Also, it is always the case that at least one person in the comparison group of graduating seniors received the lowest score of 1 on a section, so a rank of exactly 0 never happens in practice. You will receive a separate score rank for each of the four primary scores (English, math, reading, and science), and for the combined English/writing score and essay score if you took the ACT with writing. You can find the current ACT score ranks here. In order to calculate the score rank, your score must be compared with another group of ACT test takers. The comparison group used is the last three years of high school graduates who took the ACT test. (Your score is not compared to other scores from the same test you took.) The comparison group remains fixed for all ACT tests administered in the current school year. For example, for the ACT tests administered in the 2013-2014 school year (August to June), the comparison group is ACT test takers from the graduating senior classes of 2011, 2012, and 2013. There are many third-party resources available for ACT test preparation. When it comes to practice tests, however, my opinion is that you should only use previously administered ACT exams. These ACT tests are available from the following sources. First is the "The Real ACT Prep Guide", which contains five actual ACT tests along with complete explanations. The book is published by Peterson's and available online or in book stores. A second "must-have" resource is the yearly practice test. Each year, ACT, Inc. releases a guide called Preparing For The ACT, which includes a previously administered ACT, different from those used in the book mentioned above. Currently, each practice test is one of four ACT exams being used for this purpose. A third resource for actual tests are those released via the TIR service. (For more information about this service, see Can I get my test back?) If you have siblings or friends who have taken the ACT in either April, June, or December, you may be able to obtain a test from them. The answer depends on the school(s) to which you want to apply. ACT, Inc. will allow you to report any or all test scores. (You may not, however, choose the reading score from one test date and the math score from another test date, for example, to make a "superscore".) For example, suppose you take the regular ACT twice. You could report only the scores from the one test date that you feel is your best ACT test result. However, each college and university can set its own policy for scores. College A may leave the choice up to you as to which scores to send, whereas University B may want to see all of your scores. Note that this is essentially done on an honor system, since ACT, Inc. will allow you to delete the score for a particular ACT test date from your record. The 2013 ACT national test dates in order from most popular to least popular were: September, June, April, October, December, and February. Such data are not released by ACT, Inc., but it is possible to estimate a test date's popularity by counting unique visitor accesses to this web site. This graph shows the relative number of ACT downloads from erikthered.com for last year. Many students take the ACT for the first time in June as juniors. Some students will take the ACT for the first time in the fall months as seniors, along with many other seniors taking it for the second time. Also shown in the table is the variation in your math score on the different tests, given that you had gotten five questions wrong or left blank (lower scores will vary less than those shown in the table). The ACT curve will adjust your score up for harder tests and down for easier tests. In this way, there is no benefit to having an easier test, and on the other hand, there is no downside to having a harder test. So, the answer to the question is: Don't worry about when the ACT is "easiest". Take the test in the month that best suits your study schedule. Whether you have time to study for the test or not is a much bigger factor in determining your score than variations in the difficulty of the test. The ACT "curve" generates a scaled score (1-36) from your raw score (the number of questions answered correctly). This curve is designed to correct for minor variations in the difficulty of the test. In this way, there is no advantage to getting an easier test and no disadvantage to getting a harder test. For example, suppose that on the ACT math section, you get 30 questions correct out of the 60 questions. On the April 2010 ACT you would have received a math score of 19; on the June 2010 ACT you would have received a 20; and on the December 2012 ACT you would have received a 21. The April 2010 test was a little easier than average, the June 2010 test was close to average, and the December 2012 test was harder than average. Another way to look at it: in order to score a 20 in math, you would need a raw score of 31 on the easier test (April 2010), 30 on the average test (June 2010), and only 29 on the harder test (December 2012). A common myth about the ACT curve is that the average test taker should avoid a particular test month if a large group of strong students will be taking the ACT that month, and instead take the test when a large group of weaker students will take the test. The (incorrect) assumption here is that the curve will push down the average student's score in the first situation (large group of strong students) and pull it up in the second situation (large group of weak students). The reality is that the curve only reflects the difficulty of that particular ACT, not the quality of students taking the test. For example, suppose that in a particular month, a large group of strong students take the test. Even if they all get perfect 36s, your score will be the same as it was had they not taken the test. In the same way, a large group of weaker students taking the test will not affect your score. The math curves from some of the previously released ACT tests (those given in April, June, and December) are available in this PDF file (2 pages). In general, no. When you get your scores via the web, you will get scores for the English, math, reading, and science sections along with your composite score and ranks. About two weeks later, the web site score report will also include your combined English/writing score, as well as the essay score. You will not get your test booklet back, and you can not see which questions you got right or wrong. However, if you take the ACT on a Saturday in April, June, and December, you can get (for an extra fee) a copy of the test booklet along with the answer key and your answers. (If you took the optional writing test, you will get a copy of the writing prompt and the two readers' scores. After you receive these materials, you may order a copy of your essay for an additional fee.) See the ACT Test Information Release (TIR) web page for more details. This service is not available for tests taken outside of the U.S. and Canada. The service is available for Sunday ACT tests taken in April only. Yes, most four-function, scientific, and graphing calculators are permitted. Calculating devices that you cannot use include: cell phone calculators, calculators with a full QWERTY keyboard, and tablets or laptops. Also prohibited are certain Texas Instruments calculators: the TI-89, TI-92, and TI-Inspire (CAS version only). See this act.org web page for a complete list of banned calculators. Although no questions on the ACT math section will require a calculator to solve, there may be questions which will be faster or easier to answer with a calculator. It is much better to bring a calculator that you are familiar with than to bring a sophisticated calculator that you really don't know how to use. If I had more time, I would put a calculator review here. But for now, I would say: If you have a TI-83 or TI-84 and are already comfortable with it, of course go ahead and bring it. Otherwise, something like a TI-30 XS Multiview (about $14) is a good choice. Officially, no, but in practice, yes. Although ACT, Inc. will strongly suggest that you not bring a phone with you at all, the prohibition is against the use of the phone. So, you should turn it off and put it away before you go in. "Airplane mode" is not good enough: turn it off. (It is a good idea to take a backpack or bag to the test center to hold a snack and an extra calculator, as well as to provide a place to stow your phone.) Do not take your phone out (say, during a break between sections) or turn it on until the test is over and you have been allowed to leave. Yes. Along with students too young for high school, adults take the ACT as well, for a variety of reasons. Some are entering college later in life, others are tutors or work for tutoring companies. (Note that if you took the ACT more than five years ago, your old scores may not reflect your current abilities. Nonetheless, you may send ACT scores to a college or university for tests taken any time after October 1, 1966.) You can register for a national test date here just like any other student. Sorry about that. But ACT, Inc. actually has a nice ACT FAQs page of its own where you can go to find information that I couldn't provide here.